My mushroom mentor (who has moved away, woe!) told me that one of his favorite things to do with fresh black trumpet mushrooms is to make it into a compound butter with a shallot and then rub it on freshly picked sweet corn. That sounded hard to me. I’ve never made a compound butter before! But on the way to feed the pigs tonight, I spotted a small flush of mushrooms, and patted myself on the back. Go me! It was too small to bother turning on the dehydrator, so I had to think of something to use it up tonight, with just me at home. Then I remembered that I also had sweet corn that needed to be eaten as well, so here’s what I did and will soon be doing again, because yum! Very simple. Saute a small diced onion and four or five fresh black trumpet mushrooms (or reconstituted dried ones) in two tablespoons of butter until the onions are soft. 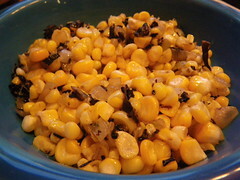 Chop the kernels off the corn cobs and simmer in the butter for three or four minutes. Add a pinch of salt. Who knew. Mushrooms and corn? It’s really, really good. Don’t forget — we sell them, here! That sounds amazing. Just found a bunch of trumpets. Was looking for compound butter recipes and found this. I’m going to pick up some corn at the farm stand and give this a try – many thanks!